National Weather Service Meteorologist Ryan Ellis says winds topped 60 miles per hour and might have reached 100 m.p.h. in some places. Ellis says teams will go out today to determine whether three suspected tornadoes actually touched down. "Straight line wind damage will usually have all of the damage pointing in the same direction. Whereas, tornado damage usually has signatures where some damage is pointing in one direction, and then very close by you'll see damage pointing in the opposite direction," Ellis explains. Ellis says milder, but still strong, winds are expected from the Triangle to the coast today. Duke Energy spokesman Tom Williams says about 120,000 North and South Carolina power customers were affected by yesterday's storm. "The wind blew down very large trees in many cases, knocked out power lines," Williams says. "We we encourage people if they see a power line on the ground, just assume it's live and don't go near it. And call Duke Energy and we'll be right on it if it's not in the system." Williams says power have been restored to more than half of customers. February 24: The National Weather Service issued dozens of tornado warnings Wednesday, as severe storms made their way through North Carolina. 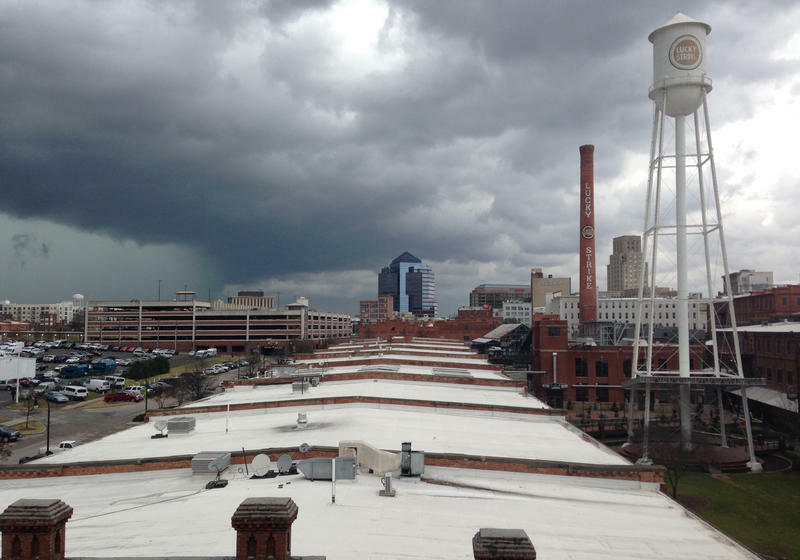 The first line of storms dropped heavy rain and wind in the Charlotte area this morning, and quickly moved into northeastern North Carolina. National Weather Service meteorologist Katie Dedeaux says she saw rotations appear quickly, which prompted today's warnings. Dedeaux was watching the second group of storms moving east in a line from the Triangle to the Sandhills during the early evening hours. "[Winds] are going to be very strong, so any severe thunderstorm warning needs to be taken just as seriously as a tornado warning," Dedeaux says. There were also severe thunderstorm warnings in effect across the state. These so-called "super-cells" knocked out power to more than 100,000 Duke Energy customers in North Carolina. The Granville County Sheriff's Department says at least three homes have been damaged and one has been destroyed in the Oxford area. As of Wednesday evening, the North Carolina Department of Public Safety said it had not received any reports of injuries. "The storms are still moving through North Carolina, and so we are getting occasional reports of scattered power outages, downed trees, that type of thing," said DPS spokeswoman Julia Jerema. "Fortunately, nothing too severe has been reported at this point." Forecasters say the storm is expected to move away from the state this evening.